The debate over horse slaughter is a composite of agricultural industry, animal welfare, constitutional, environmental, health, and regulatory concerns. Part II of this paper addresses the history of and cultural taboo ascribed to horsemeat consumption. Part III presents federal and state laws, administrative regulations and guidelines, major court cases, and proposed and pending legislation related to horse slaughter. Part IV describes associated issues, policy, and advocacy resulting from and effecting horse slaughter in the United States. Whether or not legislation should permit domestic horse slaughter is a controversial issue in the United States. In the U.S., a population of just over 10 million horses plays the dual role of companion animal and livestock. The American horsemeat market lay largely overseas in Belgium, France, and Japan, which consider horse a delicacy, or otherwise in Italy, Russia, and Switzerland, where it serves as a protein alternative. Since the year 2000, the number of American horses slaughtered for human consumption each year has wavered between 66,000 and 170,000. (Food and Agric. Org., Resources , available at http://faostat3.fao.org/home/index.html#DOWNLOAD ). In 2007, three federal courts recognized legislation that effectively prohibited the sale of horsemeat for human consumption. The resulting ban on domestic horse slaughter displaced three existing horse slaughter plants and American horse slaughter shifted to Canada and Mexico. On November 18, 2011, federal legislation banning horse slaughter lapsed, prompting a renewed interest in horse slaughter advocacy. The debate over horse slaughter is a composite of agricultural industry, animal welfare, constitutional, environmental, health, and regulatory concerns. Part II of this paper addresses the history of and cultural taboo ascribed to horsemeat consumption. Part III presents associated issues, policy, and advocacy resulting from and affecting horse slaughter in the United States. Part IV describes federal authority over horse slaughter, including legislation, administrative regulations, congressional appropriations' effects, and implications of the Wild and Free-Roaming Horse and Burro Act. Part V discusses state authority over horse slaughter, including the interaction between state and federal laws and state horse slaughter bans. And Part VI considers proposed and pending legislation related to the future of domestic horse slaughter for human consumption. People have been eating horses for over 400,000 years. (Svend Hansen, Archaeological Finds from Germany , 2 (2010), available at http://www.dainst.org/sites/default/files/media/abteilungen/eurasien/event/archaeologische_funde_englisch.pdf . Horsemeat was easily incorporated into the diet of nomadic and agricultural societies from their inception, but with domestication, horses became valuable as a means of transportation and labor. Other cultures eat horsemeat as an alternative to more conventional meats and some countries, like the U.S., never embraced horsemeat and consider eating horses taboo. To this day, about 1 billion people or 16% of humans, eat horsemeat. The greatest rate of horsemeat consumption is in China, at a rate of 421,000 tons in 2005, followed by Mexico at 76,770 tons, and Kazakhstan at 54,000 tons. In comparison, France trailed eating 24,500 tons of horsemeat, Japan ate 15,840 tons, and Belgium consumed 9,470 tons. Horsemeat is described as slightly sweet, tender, and gamier than beef, with more iron and protein, and less fat, cholesterol, and sodium. Horsemeat is rich in B vitamins and omega fatty acids and does not lose tenderness as the animal ages. (AFAC, The Alberta Horse Welfare Report , 6 (Feb. 2008), available at http://equineenews.osu.edu/documents/HorseWelfareReport1-AFAC.pdf ). Neanderthals were hippophagists. They stalked pony-sized herds, traversing the Eurasian steppes and savannahs in the Stone Age, hunting for horseflesh. Evidence from archaeological sites indicates that the horse was an important resource for prehistoric man. Anthropologists believe that 2-3 million years ago, the prehistoric human diet was mostly vegetarian, but supplemented by small game and scavenged meat. Adaption to tool use allowed early man to transition from scavenger-gatherer to nomadic hunter-gatherer. Excavations containing butchered horse remains date back 400,000 years near Helmstedt, Germany and became increasingly prevalent among Neanderthal sites around 50,000 years ago. Hohle Fels Cave in Germany contained a 30,000-year-old horse sculpture and equine bones and Chauvet-Pont-d’Arc, Lascaux, and Pech-Merle caves in France had 15,000-30,000-year-old paintings depicting horses as prey. (Alexander Marshack, Images of the Ice Age, 48 Archaeology 4 28-36, 38-39, 34, 35, (1995) available at http://www.jstor.org/stable/41771117 . St. Mary’s Reservoir in Alberta, Canada held 10,000 year-old horse skeletons with crushed vertebrae and butcher marks. Until 3,000 to 6,000 years ago, horses’ relationship with man was that of prey and predator. (Hillary Mayell, Remains Show Ancient Horses Were Hunted for Their Meat , Nat. Geo. News (May 11, 2011), available at http://news.nationalgeographic.com/news/2001/05/0511_ancienthorses.html ). When in history early humans first tamed the horse varies by location. Researchers posit that the easiest method of breaking the first wild horses may have been to kill a mare and raise her foal. (Stanley J. Olsen, The Horse in Ancient China and Its Cultural Influence in Some Other Areas , 140 Acad. Nat, Sci. 2, 151-189, 172 (1988), available at http://www.jstor.org/stable/4064940 ). With little equipment or experience, the size of the horse and its perception of predators on its back impeded the use of horses as transportation, but once achieved, the use of horses for labor and riding spread quickly. Horse bones were interred with domesticated sheep and cattle in graves near Samara, Russia 4,800 years ago. Neolithic Botai people in Kazakhstan first adopted the horse for meat, milk, and service as pack animals 3,500 years ago. Skeletons from 2,000 years ago show a diversion in phenotype and premolar trauma, suggesting horse breeding controlled for favorable physical traits in conjunction with domestication. The use of horses in organized military operations appeared after 1000 B.C. (David W. Anthony and Dorcas R. Brown, The Secondary Products Revolution, Horse-Riding, and Mounted Warfare , 24 J. World Prehist. (2011) 131-160, 134, 137, available at http://www.jstor.org/stable/41289965 ). To the Botai people who bordered on Siberia, horses may have been superior to cattle or other livestock because they have prehensile lips, which allow them to graze self-sufficiently in the winter. Thus, the horse became a mainstay of Kazakhstan’s nomadic culture. To this day, horsemeat serves as a Kazakh staple, horse fat is used to wean human babies off milk, and kumys, fermented mare milk, continues to be a traditional drink. Kazakhs typically slaughtered surplus horses or those past their productive years one at a time, out in the open. Kyrgyzstan, Turkmenistan, and Mongolia have similarly nomadic cultures, also integrating horsemeat into a main part of the diet. Mongolians, for example, drink horse milk wine called airag and maintain that horsemeat warms the body for a day’s work. ( Eating Horses: The Evolutionary Significance of Hippophagy , Marsha A. Levine, 72 Antiquity, 90-100, 92, 93, 99 (1998), available at http://www.arch.cam.ac.uk/~ml12/download/hippophagy.pdf ). Native Polynesian Tongans valued horses for field labor, so while traditionally eaten, slaughtering a horse was of some occasion. (Frederick J. Simoons, Eat not this Flesh, Food Avoidances from Pre-history to Present , 192-193 (U. of Wis. Press 1994)). Like Tongans, in Italy, horsemeat may have been adopted as part of a frugal, unsentimental, agrarian lifestyle. Italy, which consumed 63,000 tons of horsemeat in 2005, has the third highest rate of consumption. Russia also seems to have little stigma associated with horsemeat. In comparison, France, Belgium, and Japan treat horsemeat as a delicacy, aligned with veal prices at €12-20 per pound for the finer cuts, whereas within Argentina, Denmark, Germany, Hungary, Iceland, Serbia, Spain, and Switzerland, opinions towards horsemeat vary. (Sylvain Leteux, Is Hippophagy a Taboo in Constant Evolution? 3 Inst. Rech. Hist. Sep, 3, 6, 7 (U. Lille 2011), available at http://www.institutpaulbocuse.com/media/phototeque/food-hospitality/revue/1/hippophagy.pdf ). Dissonance among Europeans towards eating horses has a religious component. Nordic people in ancient Scandinavia sacrificed and ate horses in tribute to the gods. The ancient people of Gaul and the United Kingdom slaughtered horses in worship to the goddess Epona and some British and Germanic pagans killed horses as part of ceremonial worship to the God Odin. Amidst Christian conversion efforts in these areas, Pope Gregory III banned horsemeat consumption in 732 AD, linking it to barbarism. In the Bible, Leviticus 11 reads, “among the animals, whatever divides the hoof, having cloven hooves and chewing the cud; that you may eat,” consequently prohibiting the consumption of pigs and horses. The passage declares those meats unclean and Christian anxieties with horsemeat followed. At the same time, domestication of the horse and increased farming bred its utility for labor, war, and transportation in lieu of meat. (Chris Otter, Hippophagy in the UK: A Failed Dietary Revolution , 35 Endeavour 2-3, 80-90, 83, 84 (2011), available at http://www.ncbi.nlm.nih.gov/pubmed/21889798 ). Voltaire told the story of France executing a groom, Claude Guillon, for eating horsemeat during Lent in 1629, preceding a horsemeat prohibition that lasted until the French Revolution. Napoleon’s troops and the French populace began eating horses en masse in the early 1800s. In 1866, France legalized horsemeat consumption to relieve meat and grain shortages. Initially horsemeat was considered a meat of last resort, but the practice gained traction over time. The meat is now epicurean cuisine in France, concentrated around Paris and Nord-Pas de Calais, and in areas of Canada, particularly French-speaking Quebec. (Kari Weil, They Eat Horses, Don’t They? Hippophagy and Frenchness, 7 Gastronomica 2, 44-51, 44 (2007), available at http://www.jstor.org/stable/10.1525/gfc.2007.7.2.44 ). Horses in the United States have, for the most part, enjoyed the status of companion and working animals. America’s first domesticated horses arrived by European ship in the early 1500s. Horses escaped or were left behind by the Spanish, forming herds of feral Mustangs, which Congress has declared, “living symbols of the historic and pioneer spirit of the West.” ( 16 U.S.C. § 1331 (1971) ). Comparably, in 2007, Judge Benavides for the Fifth Circuit wrote, “The lone cowboy riding his horse on a Texas trail is a cinematic icon. Not once did the cowboy eat his horse,” except for that one time, as the judge footnoted, in the film Seven Men from Now. But those were thieves. ( Empacadora de Carnes de Fresnillo, S.A. de C.V. v. Curry , 2005 WL 2074884 (2005)). Other than by cultural rebels, for the novelty of European cuisine, as a cure for obesity, or to exercise placement at the top of the food chain, there seems to be little demand for horsemeat by Americans. Most notable is the Harvard Faculty Club dish, chicken-fried steak with onion gravy, known to come from well-bred racehorses from Suffolk Downs. Even that dining phenomena was a product of World War II rationing, available on and off from the 1940s to the 1980s. In 1951 Portland, and again in 1973 Connecticut, high meat prices led to temporary surges in horsemeat consumption. For European countries too, scarcity of meat supply was a driving force behind adopting horsemeat into the diet. (Mare Zelank, High Class & Horse Steak, Behind the Scenes at the Harvard Faculty Club , Harv. Crimson (1994), available at http://www.thecrimson.com/article/1994/2/10/high-class-horse-steak-pbtbhere/ ). When surveyed, 70-80% of Americans did not find horsemeat to be a compelling protein source. (Public Opinion Strategies, POS in the News (2006) http://pos.org/2009/04/pos-in-the-news-4709/ ; Lake Res. Partners, Research Findings on Horse Slaughter for Human Consumption (2012)). As a practical matter, horses are poor conductors of feed to meat, expensive to maintain, disposed to be nervous and dramatic, and rather fragile when herded onto stock trailers. And America’s agricultural industry feeds the meat pipeline with an abundant supply of cattle with docile temperaments and bodies shaped like square blocks of meat. The United States is not alone in eschewing horsemeat. Australia, Britain, Brazil, English Canada, Columbia, India, Ireland, Israel, New Zealand, and Poland, some aspects of Christian, Catholic, Jewish, and Muslim religions, as well as gypsies or Romani people, shun the practice of eating horses. In Spain, foal meat is known as “red deer” and a 1970s American cookbook named a horse recipe “German Meatballs.” (Christa Weil, We Eat Horses, Don’t We? The New York Times (Mar. 5, 2007), available at http://www.nytimes.com/2007/03/05/opinion/05weil.html?_r=0 ). Likewise, the British euphemism for horsemeat is “cheval meat,” using the French word for horse, and they have also called it “bad beef.” Some have suggested that in Britain, the stigma resulted from black market knackers following the Papal ban. This sentiment was only cemented by its proscription as substitute meat availed by the lower class. (Annie Gray, No Horsemeat Please, We’re British , The Guardian (Feb. 8, 2013), available at http://www.theguardian.com/commentisfree/2013/feb/08/no-horsemeat-please-british ). Despite Gordon Ramsay’s propagation of horsemeat sales in his restaurants, as displayed on television’s, “The F Word” in 2007, British horsemeat sales did not surge. More recently, although some butchers in France reported that horsemeat sales rose for a short period, the 2013 horsemeat scandal did not appreciate its value either. Rather, the fraudulent mislabeling of hamburger, lasagna, and pasta as all beef resulted in consternation, DNA testing, alterations in the meat supply chain, and arrests. Americans also became suspicious, prompting restaurants, such as Applebees, Burger King, Denny’s, Fudrucker’s, Jack in the Box, McDonald’s, and Wendy’s, to release public relations statements specifically denying horsemeat in their products. Additionally, Carl’s Jr., Hardee’s, Red Robin, Sonic, and Whataburger, clarified that their restaurants used 100% beef. (Gabe Ulla, On the Record, U.S. Restaurant Chains Deny Serving Meat in their Hamburgers , Eater (Feb. 21, 2013), available at http://eater.com/archives/2013/02/21/horse-or-no-horse.php ). Given the abundance of protein sources, a compelling reason for America to redefine Mr. Ed, Secretariat and Seabiscuit’s slower descendants, and Jimmy and Sally’s elderly Shetland pony as a haute taco or a mod hamburger, is lacking. Some observers attribute the sentimentality, romanticism, and anthropomorphism afforded the horse to the female gender and popular culture, as exemplified by Black Beauty, My Little Ponies, Robert Redford, and Willie Nelson. However, to reconcile subjecting the family pet, sporting accomplice, and compatriot mascot to the food processing industry is to redefine the relationship of man and horse. A myriad of issues surround horse slaughter. Horses are expensive animals to maintain, so there tends to be a continuous crop of “unwanted horses.” Although there is a lack of data to substantiate the scope of the “unwanted horse problem,” its genesis lay in a collection of causes, including circumstances specific to each horse and owner, backyard breeders, failed or retired racehorses, rodeos, and the nurse mare and Premarin industries, which create a glut of mares and “byproduct” foals. Mary W. Craig, Just Say Neigh, A Call for Federal Regulation of By-Product Disposal by the Equine Industry (2006) 12 Animal L. 193 ). If a horse is unwanted by its current owner, it may still be usable. However, if there is no apparent buyer for a horse, the owner may turn to slaughter and euthanasia as the most convenient solution. Slaughter and euthanasia are distinguishable because slaughter is imposed to harvest products from the animal whereas euthanasia, which means “good death,” is meant to avoid pain and distress to a pet or unhealthy animal. Many consider the cost of euthanasia and disposal to be part of responsible horse ownership, but for others, slaughter is more compelling. However, horses’ dispositions can be considered painstakingly unsuitable to commercial slaughter practices, which are designed for cattle and amplify the experience by treating as a commodity, horses accustomed to being handled as a pet. (USDA, The Unwanted Horse Issue, What Now? Rev. Proc., 24, 28, 50 (June 18, 2008), available at http://www.csrees.usda.gov/nea/animals/pdfs/horse_proceedings.pdf ). A horse is somewhat of a luxury good. To provide for the basic needs of a single horse, an owner must afford an annual expense of approximately $1,800 to $2,400. Realistically, a portion of the horse population will necessarily be aged, injured, sick, or difficult to handle. To an owner whose finances employment, location, or physical capabilities are changeable, maintenance costs can become expensive and burdensome. Additionally, the cost of horse care, such as feed or board may fluctuate with the market or climate, making what was once plausible horse ownership impracticable. Otherwise, the horse owner may lose interest, change their objectives, or otherwise no longer find the horse useful or suitable for their purposes. Should a more suitable owner buy the horse, it is no longer unwanted, but if no interested buyer is available, the animal becomes what is dubbed an “unwanted horse.” (USDA, The Unwanted Horse Issue, What Now? Rev. Proc., 29, 86 (June 18, 2008), available at http://www.csrees.usda.gov/nea/animals/pdfs/horse_proceedings.pdf ). Approximately 1.5% or 150,000 of America’s 10 million horses are slaughtered each year. Another roughly 1.5% of horses die on their owner’s premises or are euthanized annually. Additionally, the BLM maintains over 40,000 horses in off-range holding facilities and horse rescue groups, breed organizations, and retirement farms house an unknown number of horses. (BLM, Off the Range Facility Report (July 2013), available at http://www.blm.gov/pgdata/etc/medialib/blm/wo/Planning_and_Renewable_Resources/wild_horses_and_burros/statistics_and_maps/holding__adoption.Par.3899.File.dat/Facility%20Reports%2010-10%20-%201-13.pdf ). And more horses are the subject of reported and unreported cases of abuse, neglect, or abandonment. Notably, there is no universal tracking system in place to provide reliable data about the scope, disposition, or cause of the population of unwanted horses, making a resolution to the problem equally impalpable. An owner with an unwanted horse may prefer euthanasia. The most affordable humane means of euthanasia may be by firearm. When used, the shot must be at least a .357 caliber, equivalent to 9 mm, in order to penetrate the equine skull. Alternative methods, such as electrocution have been deemed inhumane. (Iowa St. U., Coll. Vet. Med., Unacceptable Methods of Euthanasia (2013), available at http://vetmed.iastate.edu/humaneeuthanasia ). Of course, the most common means of euthanasia is by intravenous injection of the drug sodium pentobarbital, which suppresses the central nervous system, causing a loss of consciousness, progressing into a loss of respiratory function, and ending in cardiac arrest. The average cost to have a veterinarian euthanize a horse is $66 and does not account for disposal of the body. Disposal costs for large animals vary and must consider environmental contamination and pathogen containment, burdens for which many commercial facilities have limited capacity. Biodegradation options require about nine months to break down a horse’s body and include burial by backhoe rental for $150 to $500 and composting at a managed property or landfill for $80 to $500. Other options include rendering, which uses heat to kill microorganisms and break down the tissue into usable byproducts at a cost of $75 to $250, cremation for $600 to $2,000, and alkaline hydrolysis, which digests the body into a pathogen free aqueous solution called effluent. The latter may be available at veterinary colleges and industrial research facilities. (USDA, The Unwanted Horse Issue, What Now? Rev. Proc. (June 18, 2008), available at http://www.csrees.usda.gov/nea/animals/pdfs/horse_proceedings.pdf ). The impetus behind the American horsemeat industry lay in foreign markets. In 2007, when horse slaughter was legal in the United States, three publicly held Belgian owned slaughter plants processed horses in Illinois and Texas. Velda NV opened Cavel International in DeKalb, Illinois in the late 1970s. Cavel employed 55 workers when it closed in 2007 and processed about 1,000 horses per week. ( Cavel Int. v. Madigan , 500 F.3d 558 (7th Cir. 2007). Multimeat NV opened Beltex Corporation in Fort Worth, Texas around 1980 and employed 90 people to process about 500 horses per week, and Chevedico NV opened Dallas Crown in Kaufman, Texas in the late 1970s, employing 50 to 60 workers and processing 300 horses per week. Dallas Crown claimed to lose $16 million when it closed in 2007 and together with Cavel spent $6 million per year in transportation costs to export meat to France. (Mary Jacoby, Why Belgians Shoot Horses in Texas for Dining in Europe , Wall St. J. (Sept. 21, 2005), available at http://online.wsj.com/article/0,,SB112726478131246913,00.html ). United Nations agricultural data documented U.S. horse slaughter information before and after the U.S. horse slaughter ban. On average, in 2005 and 2006, the three operating U.S. plants together processed almost 100,000 horses annually and exported about 40,000 live horses to Canada and Mexico each year. From 2008 to 2010, the U.S exported live horses to Canada and Mexico at a rate of 140,000 to 160,000 per year. Before 2007, U.S. horse slaughterhouses sold about 10% of their meat to domestic zoos and wildlife operations, but mostly exported, at a rate of about 17,500 tons of horsemeat worth $60 million per year, to Belgium, France, and Japan. France and Belgium consume more horsemeat than they produce. In 2005 and 2006, the U.S. provided about 15% of France’s estimated 25,000 tons per year of horsemeat imports and about 17% of Belgium’s 33,000 tons of horsemeat. (Food and Agric. Org., Resources , available at http://faostat3.fao.org/home/index.html#DOWNLOAD ). Japan, which has 12% of its land available for grazing area, imported virtually all of its 8,000 tons of horsemeat for human consumption in 2005, of which the U.S. provided about 25%. (OECD, Trade and Agriculture Directorate (2009), at http://www.oecd.org/tad/agricultural-policies/43245392.pdf ). Horse slaughter plants in the United States process horses in a manner similar to cattle. Under the Humane Methods of Slaughter Act (HMSA), a horse must be rendered insensible before processing to ensure humane slaughter. The most common means of causing insensibility is the penetrating captive bolt gun, a trigger pull air compression gun, activated by a firing pin, that discharges a metal bolt to cause direct trauma to surface brain tissue before a spring tension system recoils the bolt back into the barrel. A successful firing renders the animal unconscious, and should be verified by witnessing the animal’s immediate collapse, lack of voluntary movement or vocalization, an immediately rigid body followed by involuntary limb movement, cessation of normal rhythmic breathing, and eyes that remain open and stare straight ahead. Bolt guns are the preferred method for rendering an animal insensible for slaughter because they leave the brain stem intact, allowing the heart to continue pumping and assist in bleeding the animal. Once the animal is rendered insensible to pain, it is shackled by a hind leg, hoisted, exsanguinated or bled out, and butchered. (Iowa St. U. Coll. Vet. Med., Gunshot or Penetrating Captive Bolt , available at http://vetmed.iastate.edu/humaneeuthanasia/en/gunshot-or-captive-bolt ). http://www.progressivereform.org/articles/OSHA_1003.pdf). Before 2007, the three operating horse slaughterhouses, Beltex, Cavel, and Dallas Crown, were cited for violating federal regulations and local ordinances regarding water, the environment, and worker safety. Beltex allegedly failed to comply with local wastewater regulations and pumped blood into the nearby creek in 2000. It was fined $22,000 in OSHA violations by 2003. Cavel exceeded acceptable levels of animal residue in wastewater discharge on 68 days in 2006 compliance results. (Vickory Eckhoff, Texas Mayor Paula Bacon Kicks Some Horse Slaughter Tail , Forbes (Jan. 10, 2012), available at http://www.forbes.com/sites/vickeryeckhoff/2012/01/10/texas-mayor-paula-bacon-kicks-some-tail/ ). Dallas Crown, in 6,500 person town of Kaufman, Texas, stressed the city’s legal and wastewater treatment systems by receiving 29 water permit citations and requesting a jury trial for each. (Dallas Crown Wastewater Citations (2004-2005), available at http://www.kaufmanzoning.net/DC2004Wastewater.htm ). In 2004, Dallas Crown earned $12 million in revenue for its Belgian parent company, but paid $5 in taxes to the town of Kaufman. 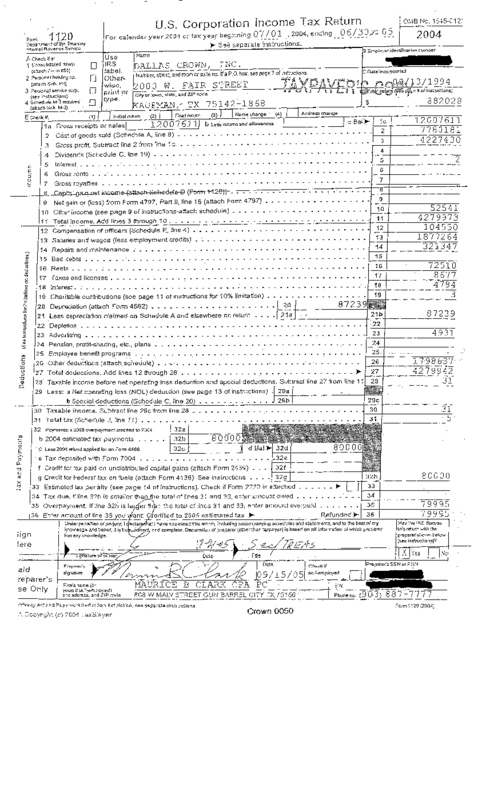 (Dallas Crown, U.S. Corp. Income Tax Return (2004), available at http://www.kaufmanzoning.net/DCTaxForm1.jpg ). Besides drug contamination concerns, welfare advocates and veterinarians raise concerns over the slaughter process as it pertains to horses. On horses, the landmark for a bolt gun is not between the eyes. It lay at the intersection of two lines drawn from the outer corner of either eye to the top of the opposite ear, or otherwise, two to three inches above the intersection of two lines drawn from the outer corner of either eye to the base of the opposite ear. (Iowa St. U. Coll. Vet. Med., Anatomical Landmarks (2013), available at http://vetmed.iastate.edu/humaneeuthanasia/en/anatomical-landmarks ). This area is narrow and lay high on the horse’s poll, often covered by the forelock. In comparison to cattle, horses have longer neck and narrower heads, which they lift to look for danger in the wild and when stressed, such as if a novel item is brought to their face. (Temple Grandin, Safe Handling of Large Animals , 14 J. Occup. Med. 2 (1999), available at http://www.grandin.com/references/safe.html ). Thus, moving a captive bolt gun to the horse’s head is likely to cause the horse to throw his head in the air, making bolt placement difficult. That workers, equipment, and inspection are fallible, kill boxes may be large and slippery, and high volume plant is pressurized compound the risk that multiple bolt applications will be needed. Although veterinarians recommend that a trained individual place a well-maintained captive bolt firmly on the target area and that horses’ heads be restrained, slaughterhouses often do not risk the manpower to hold a horse’s head, they do not want a halter on the horse, and they should witness the horse fall to the ground uninhibited after being stunned. Under FSIS regulations, a single blow to the head should render the animal unconscious, but investigations of horse slaughter plants have documented bolt use to the contrary. (FSIS Directive 6900.2 § 1902 (2003), available at http://www.fsis.usda.gov/OPPDE/rdad/FSISDirectives/6900.2.pdf ). Auction and transportation practices are also stressful and expose horses to injury. Horses maintain well in quiet environments with a habitual routine and are highly fear motivated. At auction, fear stimuli abound, triggering adrenaline and herd flight responses. Auctions often use loudspeakers, and workers’ use electric prods or sticks to direct horses to the ring by a series of chutes and gates. Once sold, loading a number of unwieldy, stressed animals into a dark enclosed trailer can be difficult. Worse, double-decker stock trailers, built for cattle, may have ceilings 5 feet 7 inches in height, which is significantly lower than recreational use horse trailers recommend ceilings of 7 to 8 feet in height. A low ceiling increases the risk of eye and head injury and makes it difficult for horses to use their neck for balance. Horses are prone to leg injury because they must balance their large mass on legs consisting of many small bones and no muscle below the knee. When animals of different sizes and stallions, which are typically separated from other horses, are transported together, perhaps without skid mats, the risk of fighting and trampling increases. (Temple Grandin, Survey of Trucking Practices and Injuries to Slaughter Horses , available at http://www.grandin.com/references/horse.transport.html ). APHIS admittedly lacked staffing and funding to regulate horse slaughter transport. (OIG, USDA APHIS Administration Horse Protection Program , Audit Rep. 33601-2-KC, 32 (2010)). The USDA and the American Horse Council organized the Unwanted Horse Forum on June 18, 2008 in Washington D.C., which hosted speakers from throughout the horse industry, with mixed pro and anti slaughter positions. Summarily, the forum concluded that whether or not slaughter is domestic or foreign the underlying issue that must be addressed by the horse industry is the population of unwanted horses. The forum suggested ways in which the 1.5% of horses sent to slaughter could be reabsorbed back into the system. It proposed creating a universal network to collect data and reallocate horses to appropriate potential owners, after school, educational, farm work, non-profit rescue, prisoner horse training for Border Control, and recreational programs. Other organizations that accept horses include, 4-H, breed associations, educational institutions, research facilities, retirement farms, and therapeutic programs. Also, the forum found that there was a want of education about the cost, care, suitable characteristics, realistic expectations, and the expense to train, feed, and properly care for a horse. One rescue group created the Colorado Horsecare Food Bank to assist owners who prefer to keep their horses, but are temporarily unable to afford their care. The forum strategized that irresponsible breeding and overproduction could be addressed by removing a federal breeding tax incentive program, and passing laws to require licensure and registration for breeding privileges. The government or organizations could provide a comprehensive list of disposal options and resources and subsidize or provide incentives for euthanasia and recommended standards of care, handling, and disposal of horses. (USDA, The Unwanted Horse Issue, What Now? Rev. Proc., 21, 30 (June 18, 2008), available at http://www.csrees.usda.gov/nea/animals/pdfs/horse_proceedings.pdf ). http://www.agri-pulse.com/uploaded/Order.pdf, amended by, http://www.agri-pulse.com/uploaded/Order.pdf ; see also http://docs.burningbird.net/horse/courtcase/ ). Additionally, the proposed House and Senate appropriations bills for fiscal year 2014, Agriculture, Rural Development, Food and Drug Administration, and Related Agencies Act, 2014 H.R. 2410 § 749; S. 1244 § 736, survived their respective committee meetings. (H.R. 2410, available at http://www.gpo.gov/fdsys/pkg/BILLS-113hr2410rh/pdf/BILLS-113hr2410rh.pdf ; S. 1244, available at http://www.gpo.gov/fdsys/pkg/BILLS-113s1244pcs/pdf/BILLS-113s1244pcs.pdf ). These bills, like President Obama’s proposed 2014 agricultural appropriations, Budget of the Government, 2014 § 725, would recut funding to slaughter inspections. (S.A.F.E., available at http://www.gpo.gov/fdsys/pkg/BILLS-113hr1094ih/pdf/BILLS-113hr1094ih.pdf ). The U.S. Department of Agriculture (USDA) is the executive agency that primarily administers federal horse slaughter related legislation. To fulfill its mission of promoting agricultural innovation, food distribution, conservation of resources, and sustainability, the USDA regulates farming, food safety and policy, rural development, and natural resources. The USDA’s horse slaughter relevant sub-agencies include the Agricultural Marketing Service (AMS), the Animal and Plant Health Inspection Service (APHIS), and the Food Safety and Inspection Service (FSIS). The FSIS is the public health agency directed to ensure that meat products entering the stream of commerce are unadulterated and properly branded, thus it is the agency most apt to affect horse slaughter legislation. The FSIS derives its authority from the Federal Meat Inspection Act of 1906 (FMIA) and enforces regulations and guidelines for the inspection of animals, meat, and slaughterhouses. FSIS slaughter inspection duties overlap with those of the Department of Health and Human Service’s (DHHS) Food and Drug Administration (FDA). Also, the Department of the Interior’s Bureau of Land Management (BLM) administers the Wild Free-Roaming Horses and Burros Act of 1971 (WHBA) to protect, manage, and control wild horses and burros on federal lands and ensure sustainability of rangelands for multiple uses. Four principal pieces of federal legislation control the practice of horse slaughter in the United States. First, the Federal Meat Inspection Act of 1906 (FMIA), Chapter 12, 21 U.S.C. §§ 601 et seq. ; 34 Stat. 1260, authorizes the FSIS to ensure that meat products marketed for human consumption are processed under sanitary conditions and enter the stream of commerce unadulterated and properly branded. Under the FMIA and by the authority granted to the USDA, the FSIS has jurisdiction to inspect slaughter facilities and livestock, including equines, throughout the food production process. The FMIA requires ante-mortem inspection of all horses intended for slaughter for human consumption before they enter a slaughter facility, 21 U.S.C. § 603, post-mortem inspection of carcasses for human consumption at any stage of processing, 21 U.S.C. § 604, and slaughterhouse facility sanitation and personnel conduct inspection at any slaughterhouse facility processing meat for human consumption, 7 U.S.C. § 608. The FSIS promulgated corresponding regulations in Title 9 of the Code of Federal Regulations, Animals and Animals Products, 9 C.F.R. §§ 300 et seq., that provide for monitoring and inspecting animal holding and handling, slaughter facilities operations, meat handling and packaging, import and export, recalls, and public health alerts. Once ante-mortem inspection is completed, 9 C.F.R. §§ 309-310, animals exhibiting specified diseases or conditions are classified. Condemned animals are removed and include those unfit for human consumption, such as non-ambulatory animals. Suspect animals are removed, monitored, slaughtered separately, and examined post-mortem. Suitable animals are slaughtered and examined post-mortem for signs of disease or contamination, including random sample tests for disease and residue. The Wholesome Meat Act of 1967, 81 Stat. 584, amended the FMIA to ensure that state meat inspection programs met federal standards. Second, the Humane Methods Slaughter Act (HMSA) , 7 U.S.C. §§ 1901-1907; Pub. L. 85-765, amended the FMIA to ensure that the USDA regulates slaughterhouses via FSIS oversight, requiring slaughter facilities to use humane methods of slaughter and handling for all livestock intended for human consumption. HMSA requires that all livestock be rendered insensible to pain by a rapid and effective means before being processed. The FSIS promulgated corresponding rules, 9 C.F.R. § 313, and guidelines, FSIS Directive 6900.2, to regulate the humane slaughter of livestock. Following GAO reports of persistent non-compliance, the Farm Security and Rural Investment Act of 2002 (the 2002 Farm Bill), Pub. L. 107-171; 116 Stat. 134, which was effective until 2007, included a resolution to provide for full enforcement of HMSA and increased funding for inspectors and oversight. The act required the USDA to report enforcement challenges to Congress, as in the GAO report entitled, HMSA, USDA has Addressed Some Problems but Still Faces Enforcement Challenges, published January 30, 2004. Such reporting has continued periodically, such as in the CRS Report published February 26, 2008, USDA Meat Inspection and the Humane Methods of Slaughter Act, or the CRS report published March 24, 2009, Non-ambulatory Livestock and the HMSA. Third, the Agricultural Marketing Act of 1946 (AMA), 7 U.S.C. §§ 1621 et seq., grants the Agricultural Marketing Service (AMS) the authority to provide voluntary slaughter facility inspections of animals and products in order to assign grades based on quality and yield. It applies to operations not explicitly provided for in the FMIA. Fourth, a provision of Title IX-A of the 1996 Farm Bill entitled, Commercial Transport of Equine for Slaughter (CTES), Title IX-A 7 U.S.C. note; Pub. L. 104-127, granted the APHIS authority to issue regulatory guidelines for transporting horses to slaughter, 9 C.F.R. § 88; 78 FR 27182. Under the CTES and its subsequent regulations, blind, pregnant, and horses unable to stand should not be transported to slaughter. Further, horses should not be transported on double-decker trailers, stallions should be separated, and proper records should be kept. The driver should check the animals every six hours and non-ambulatory animals should be euthanized. Every 28 hours, horses should be unloaded and provided food, water, and six hours rest. Each violation is subject to a $5,000 fine. Finally, all federal agencies fall under the province of the Administrative Procedures Act (APA), 5 U.S.C. §§ 500 et seq., that require agencies to abide by federal standards for rulemaking as overseen by the judiciary. And under the National Environmental Policy Act of 1969 (NEPA), 42 U.S.C. §§ 4331 et seq., agencies must take a hard look at environmental consequences before executing regulations with substantial environmental effect. Agencies must conduct an Environmental Assessment (EA) and issue an Environmental Impact Statement (EIS) to report their findings to the public. Federal appropriations bills effectively permit or ban slaughter by controlling funding during a particular federal fiscal year. The 109th Congress’ FY 2006 federal agricultural appropriations bill, H.R. 2744, was signed November 10, 2005, 7 U.S.C. § 1901 note; P.L. 109-97 § 794; 119 Stat. 2120, and specifically cut funding for FSIS personnel salaries and expenses towards the ante-mortem inspection of horse slaughter operations under the FMIA, 21 U.S.C. § 603, but also cut APHIS funding to inspect commercial transport of equines for slaughter under FAIR § 903, Pub. L. 104-127; 110 Stat. 888. (H.R. 2744, available at http://www.gpo.gov/fdsys/pkg/BILLS-109hr2744enr/pdf/BILLS-109hr2744enr.pdf ). The FMIA requires that FSIS inspections be conducted on all meat intended for human consumption, so horse slaughter operations were unable to comply with the FMIA and no slaughterhouse could legally sell its horsemeat products for human consumption. Thus, by design H.R. Rep. 109-255, at 107, the agricultural appropriations provision banned domestic horse slaughter. The horse slaughter defunding provision was specifically included in subsequent appropriations bills, as in the 111th Congress' FY 2010 Agriculture, Rural Development, Food and Drug Administration, and Related Agencies Appropriations Act, Pub. L. No. 111-80, 123 Stat. 2129. (H.R. 2997, available at http://www.gpo.gov/fdsys/pkg/BILLS-111hr2997enr/pdf/BILLS-111hr2997enr.pdf ). The ban was disrupted when President Obama signed the 112th Congress’ Consolidated and Further Continuing Appropriations Act, H.R. 2112, on November 18, 2011. (H.R. 2112, available at http://www.gpo.gov/fdsys/pkg/BILLS-112hr2112enr/pdf/BILLS-112hr2112enr.pdf ). The FY 2011 to 2013 agricultural appropriations bills, H.R. 5973 and S. 2375, similarly allowed the measure to lapse. (H.R. 5973 at United States Government Printing Office, available at http://www.gpo.gov/fdsys/pkg/BILLS-112hr5973rh/pdf/BILLS-112hr5973rh.pdf ; S. 2375, available at http://www.gpo.gov/fdsys/pkg/BILLS-112s2375pcs/pdf/BILLS-112s2375pcs.pdf ). But both Houses of the 113th Congress and the Executive proposed fiscal year 2014 appropriations bills H.R. 2410 § 749, S. 1244 § 746, and the executive Budget of the U.S. Government, Department of Agriculture § 725, that include horse slaughter inspection defunding provisions and are yet to be voted on. (H.R. 2410, available at http://www.gpo.gov/fdsys/pkg/BILLS-113hr2410rh/pdf/BILLS-113hr2410rh.pdf ; S. 1244, available at http://www.gpo.gov/fdsys/pkg/BILLS-113s1244pcs/pdf/BILLS-113s1244pcs.pdf ). Effective 120 days after the date of enactment of this Act, none of the funds made available in this Act may be used to pay the salaries or expenses of personnel to inspect horses under section 3 of the Federal Meat Inspection Act (21 U.S.C. § 603) or under the guidelines issued under section 903 the Federal Agriculture Improvement and Reform Act of 1996. …an official establishment that wishes to slaughter horses can apply for voluntary ante-mortem inspection…Such establishments shall pay the applicable base time, overtime, and holiday rates for ante-mortem inspection. The FSIS posted a deadline for receiving comments and an effective date for the interim rule of March 10, 2006. The Ante-Mortem Inspection of Horses regulation would have allowed slaughterhouses to avoid the federal defunding obstruction to FMIA compliance by permitting horse slaughterhouses to apply to the FSIS program and allowing them to pay agency expenses incurred during inspection of their slaughter facilities. Likewise, state legislators proposed bills creating a system of state horsemeat inspection to circumvent the federal bill. On February 21, 2006, the Humane Society of the United States sued the Secretary of Agriculture, Mike Johanns, for three claims based on the FSIS’ interim rule. First, the Humane Society alleged that the USDA and the FSIS violated the APA for failing to comport with rulemaking standards 5 U.S.C. § 553, which require a notice and comment period before issuing a formal rule. The FSIS’ interim “fee-for-service” inspection rule was to take effect on March 10, 2006 and provided a shortened rulemaking process based on public interest claims and the business loss from the slaughterhouses’ impending closure. Second, the Humane Society sued the USDA and FSIS under APA arbitrary and capricious review standards 5 U.S.C. 706(2) for violating the FY 2006 appropriations act and the FMIA. The court later dismissed this claim. Third, the Humane Society contended that the USDA and FSIS violated National Environmental Protection Act (NEPA) 42 USC § 4321 by promulgating a rule without conducting a NEPA required Environmental Impact Assessment (EIA) followed by issuing an Environmental Impact Statement (EIS). The District Court for the District of Columbia granted Beltex, Cavel, and Dallas Crown’s joint motion to intervene on March 1, 2006. On March 28, 2007, the court vacated the FSIS interim “fee-for service” ante-mortem inspection rule for being promulgated in violation of NEPA, enjoined the FSIS from implementing the final version of the rule, and declined to address the APA rulemaking violation. On April 2, 2007, Cavel filed an emergency motion to stay the court’s March 28th order, which the court denied on April 13, 2007. ( Humane Society v. Johanns , 520 F.Supp.2d 8 (2007); Humane Society v. Johanns , 2007 WL 1120404 (2007); Humane Society v. Johanns , 2007 WL 1810103 (2007)). No commercial horse slaughter plants have operated in the United States since Cavel’s plant closed at midnight on June 29, 2007. Notably, the provision did not prevent the export of live horses for the purpose of slaughter. Horsemeat companies have since shipped approximately 150,000 horses a year, to Canada and Mexico for slaughter. Horse slaughter defunding provisions had effectively banned horse slaughter from 2007 until November 18, 2011 when Congress failed to renew the defunding provision in the FY 2012 agricultural appropriations bill H.R. 2112. (H.R. 2112, available at http://www.gpo.gov/fdsys/pkg/BILLS-112hr2112enr/pdf/BILLS-112hr2112enr.pdf ). The legislative and regulatory atmosphere regarding horse slaughter remains in flux. (C) The Secretary shall cause additional excess wild free-roaming horses and burros for which an adoption demand by qualified individuals does not exist to be destroyed in the most humane and cost efficient manner possible. However, a 2004 amendment to the WHBA allows the slaughter of wild horses by removing their protected status upon adoption, sale, or death. The amendment permits wild horse sales of excess animals at the discretion of the Secretary of the Interior. An excess animal subject to sale under the WHBA is any wild horse or burro over 10 years of age if unsuccessfully adopted three times “without limitation” as to the buyer, 16 U.S.C. § 1333(e) . Interpretation of sale “without limitation” includes sale at auctions attended by slaughterhouse brokers. Again, funding can control agency actions. For example, the 108th Congress’ H.R. 2691 allowed helicopter use to round up wild horses and cut funding for the destruction, though not the sale, of healthy animals. (H.R. 2691, available at http://www.gpo.gov/fdsys/pkg/BILLS-108hr2691enr/pdf/BILLS-108hr2691enr.pdf ). Later, the 111th Congress’ FY 2010 Interior appropriations bill, H.R. 2996, specifically prohibited funding for the destruction of wild horses and burros by sale to commercial slaughter processors. (H.R. 2996, available at http://www.gpo.gov/fdsys/pkg/BILLS-111hr2996enr/pdf/BILLS-111hr2996enr.pdf ). While federal law is in limbo over horse slaughter legislation, many states have enacted legislation that either specifically bans horse slaughter for human consumption or otherwise attempts to implicitly bypass federal defunding measures by providing for state inspections under the FMIA. Whether or not such state inspection measures will be sufficient to meet FMIA inspection requirements is not clear and has not been addressed by courts at this time. What is clear is that state legislation is subject to preemption by federal legislation and regulations at some level, however, the scope of federal preemption over state laws is something courts have only begun to determine. In National Meat Association v. Harris , 132 S.Ct. 965 (2012), the Supreme Court held that FMIA’s preemption clause invalidated California’s 2008 Humane Handling law Cal. Pen. Code § 599(f) regarding slaughter of non-ambulatory pigs for human consumption. The state law prohibits: 1) receipt or purchase, §599(f)a; 2) processing or butchering, § 599(f)b; or 3) holding the animal without immediately euthanizing it, §599(f)c. Because under the FMIA, FSIS rules apply upon the entry of a livestock truck onto the slaughter premises, the Court found that the California law fell within the scope of the FMIA. The Court also found that the state law conflicted with the FMIA because the state law was “in addition to, or different than” the federal law, as per the FMIA preemption clause, and because the California law was similar to provisions that FSIS had previously considered and expressly rejected. The Court concluded that the FMIA expressly preempted the California law by impermissibly applying different standards to “the same thing, at the same time, in the same place.” The Court further emphasized that California law should not bypass federal law by applying its on-premises humane treatment requirements to pre-slaughterhouse purchases. While preemption affects the operation of slaughter facilities, some states have successfully enacted bans on the intrastate sale or slaughter of horsemeat. Since then, Texas, Illinois, and several other states have enforced bans on the slaughter, sale, or transport of horses or horsemeat for human consumption. Currently California prohibits the transport and sale and slaughter of horses for human consumption ( Cal.Penal Code § 598c ), but permits the sale of state inspected and properly labeled horsemeat and allows restaurants to serve it, though it may not be stored in “close proximity” to other meats when sold in a retail establishment. Cal.Food & Agric.Code §§ 19360 et seq. Illinois prohibits the sale, transfer, or slaughter of horses for human consumption 225 ILCS 635/1.5 . Mississippi states that the meat of horses and mules are “food unfit for human consumption.” Miss. Code Ann. § 75-33-3 . New Jersey, whose state animal is the horse, prohibits the slaughter of a horse for human consumption or the sale, transfer, or barter of horsemeat intended for human consumption as of September 19, 2012. N.J.S.A. 4:22-25.5 . Texas prohibits the sale or possession of horsemeat for human consumption and the transport of horsemeat in Texas, even for export, is illegal. V.T.C.A. §§ 149.001 et seq . Other states, without specific bans, provide for specific inspection, slaughter, or licensing requirements. Alabama requires that horses be slaughtered in separate facilities from most other livestock and that horsemeat be conspicuously marked. Ala. Code § 2-17-15 . Arizona agricultural code requires horsemeat processing facilities be licensed. A.R.S. §§ 3-2121 et seq . Georgia permits the sale of properly labeled horsemeat when the seller identifies the meat at purchase or transfer and permits horse slaughter for human consumption if the horse is kept on the premises for four consecutive days prior to slaughter with particular record of the sale. Ga. Code Ann., § 26-2-156 . Ohio requires separate licensing for the processing or sale of horsemeat, requires separate storage of horsemeat from other meat for human consumption, and requires conspicuous identification by restaurants. R.C. §§ 919.01 et. seq . West Virginia requires horse slaughter to occur in facilities separate from other animals and requires horsemeat to be clearly labeled. W. Va. Code,§ 19-2B-10 . Most other states define horses and livestock subject to other slaughter and meat laws or permit horse slaughter for human consumption and horsemeat sales, but require some combination of additional regulations, including that horsemeat be clearly, and sometimes conspicuously or specifically labeled, identified in retail establishments or restaurants, and perhaps separately stored or “denatured.” Connecticut requires clear labeling of horsemeat in restaurants. C.G.S.A. § 21a-22 . Delaware permits the slaughter of horses and sale of properly and conspicuously marked horsemeat. Florida permits the sale of properly marked horsemeat. F.S.A. § 500.451 . Maine requires horsemeat be conspicuously labeled. 22 M.R.S.A. § 2163 . Minnesota permits the sale of horsemeat for human consumption if it is conspicuously labeled. M.S.A. § 31.621 . Nebraska permits the slaughter of horses for human consumption if the meat is clearly marked. Neb. Rev. St. § 54-1909 . Oklahoma repealed its horsemeat ban Okl. St. Ann. § 1-11363 on March 29, 2013, to become effective on November 1, 2013. Okla. Sess. Law Serv. Ch. 2 (H.B. 1999). Tennessee requires that horsemeat be denatured with at least 2% charcoal. Tenn. St. § 53-7-101. And Wisconsin requires the conspicuous labeling of horsemeat. W.S.A. 97.45 . State bans on horse slaughter are not recent phenomena. In fact, in 1949, Texas passed Texas Penal Code § 719(e). V.T.C.A. Penal Code § 719(e), which prohibited the sale, possession, or transfer of horsemeat with intent, knowledge, or reason to know that the buyer or receiver intends to sell it for human consumption. The legislature re-codified the horsemeat prohibition under Texas’ civil code in 1973. Beltex Corporation and Dallas Crown opened horse slaughter plants in Texas in the late 1970s in spite of the law and continued operations undisturbed although Texas again re-codified the law as V.T.C.A. § 149 in 1991. State administrators did not address Beltex’s and Dallas Crown’s violations until 2002. That year, John Cornyn issued an opinion as Texas’ Attorney General, finding that Beltex and Dallas Crown violated Chapter 149 and that although the Texas Department of Agriculture lacked jurisdiction over Chapter 149 violations, local prosecutors had the authority to investigate and prosecute horse slaughterhouses with the cooperation of the Department of Agriculture and its meat inspection program. Cornyn also found that because simultaneous compliance with the FMIA was possible, the federal law did not preempt Chapter 149 so as to prohibit prosecution of operating horse slaughter facilities. (Tex. AG Op. (2002), available at https://www.oag.state.tx.us/opinions/opinions/49cornyn/op/2002/htm/jc0539.htm ; http://equinelaw.alisonrowe.com; Tex. AG Op. (2008), available at https://www.oag.state.tx.us/opinions/opinions/50abbott/op/2008/htm/ga-0623.htm ). On September 26, 2002, co-plaintiffs Texas horse slaughterhouses and horsemeat distributors, Beltex, Beltex’s Mexican slaughterhouse partner horsemeat supplier, and Dallas Crown, sought an injunction against their respective county district attorneys in order to avoid prosecution for Chapter 149 violations . The defendants, Tim Curry of Tarrant County, where Dallas Crown operated, and Ed Walton of Kaufman County, where Beltex operated, asserted that Chapter 149 was good law, not violative of the commerce clause, not implicitly repealed by a separate Texas statutes intending to impede sales of stolen horses ( V.T.C.A. § 148.0029 ) or inspect horsemeat (V.T.C.A. § 433.033), and not preempted by the FMIA. On April 23, 2003, the District Court of the Northern District of Texas disagreed and permitted the slaughterhouses to continue operations by temporarily enjoining the district attorneys from enforcing Texas’ Chapter 149 . The slaughterhouses filed a motion for a permanent injunction on the grounds of implicit repeal and because the foreign commerce and the FMIA preempted Chapter 149. On August 25, 2005, the District Court granted the slaughterhouses a permanent injunction, allowing them to continue process horses in spite of Chapter 149. Empacadora de Carnes de Fresnillo, S.A. de C.V. v. Curry, 2005 WL 2074884 (2005). Following the district attorney’s appeal, on January 19, 2007, the Court of Appeals for the Fifth Circuit reversed and upheld Texas law. The court denied the claim that Texas anti-horse theft and meat inspection laws implicitly repealed Chapter 149 and held that it was possible to comply with the laws simultaneously. The court held that even if the Texas laws were irreconcilable, Chapter 149 was subsequent and therefore the controlling statute and moreover, Chapter 149 was more specific and express than the general slaughter inspection laws. Thus, the Fifth Circuit held that Chapter 149 expressed the legislatures true intent. In addressing the commerce clause claim, the court held that Chapter 149 did not discriminate against other states in favor of local commerce, thus it did not violate the dormant Commerce Clause. The court further concluded that the FMIA’s preemption clause only applied to inspection and labeling regulations, but did not bar a state’s legislation regarding the legality of slaughter in the first place. As such, the Fifth Circuit vacated the district court’s permanent injunction, thus allowing the district attorneys to prosecute Beltex and Dallas Crown for violating Chapter 149. Both slaughterhouses closed in February 2007. ( Empacadora de Carnes de Fresnillo, S.A. de C.V. v. Curry , 476 F.3d 326 (5th Cir. 2007)). The Supreme Court denied certiorari on May 21, 2007. Shortly thereafter, on May 24, 2007, Illinois enacted. 225 ILCS 635/1.5 , which made it unlawful for any person to slaughter, import, export, possess, sell, buy, receive, transfer, or hold any horse when the person knows or should know that the meat will be used for human consumption. The United States’ sole operating horse slaughter plant, Cavel International challenged the slaughter law as unconstitutional. The District Court for the Northern District of Illinois rejected Cavel’s complaint. On July 17, 2007, Cavel appealed to the Court of Appeals for the Seventh Circuit and moved to enjoin enforcement of Illinois’ slaughter ban. On August 6, 2007, the Seventh Circuit granted Cavel a temporary injunction based on Cavel’s showing of irreparable harm to its business should enforcement of the Illinois law close its business. ( Cavel International v. Madigan , 500 F.3d 551, 544 (2007)). However, on September 21, 2007, the Seventh Circuit upheld Illinois’ horse slaughter ban, finding that the FMIA’s horse inspection provision was consistent with the Illinois law banning slaughter altogether. The court further held that Illinois’ legislation banning horse slaughter does not violate the commerce clause by impermissibly interfering with the federal government’s province over foreign commerce because the effect of Cavel’s closure does not substantially affect foreign trade and the domestic market for horsemeat was negligible. Thus, the Seventh Circuit vacated its injunction against enforcement of the Illinois ban, resulting in the cessation of domestic horse slaughter. Cavel ceased operations in June 2007. Cavel International v. Madigan , 500 F.3d 551 (2007). The Supreme Court denied certiorari on June 16, 2008. From November 18, 2011 until the FY 2014 appropriations bill comes into effect, there will be no express legislative ban on horse slaughter. Although the lapsed agricultural appropriations rider did not specifically ban funding for horsemeat inspection, neither did it provide any mechanism for funding. The USDA subsequently interpreted its mandate to require a grant of federal inspection to FSIS qualifying operations, created a fee for service ante-mortem inspection rule 9 C.F.R. § 352.19, and posted equine inspection services applications to its website on March 15, 2013. (FSIS, Ante-Mortem and Post-Mortem Inspection of Equines, Directive 6130.1 (2013) http://www.fsis.usda.gov/horses/6130.1.pdf ). The FSIS has since approved inspection grants for two potential horse slaughter facilities and received at least six applications for inspection grants. (FSIS, Applications for Federal Inspection (As of July 3, 2013), available at http://www.fsis.usda.gov/horses/Applications-Federal-Inspection-Equine.pdf ). Proposed plants include Oklahoma Meat Co. in Washington, Oklahoma, Rains Natural Meats in Gallatin, Missouri, Trail South Meat Processing in Woodbury, Tennessee, and Unified Equine in Rockville, Missouri. Following a plant inspection on April 23rd, the USDA granted processing inspection approval for to a 10-acre, 7,290 square foot Valley Meat Co. facility, owned by Ricardo and Sarah De Los Santos, in Roswell, New Mexico on June 28, 2013. On July 2, 2013, the FSIS granted Responsible Transportation, LLC, owned by Travis Bouslog, Chase Grenier, and Keaton Walker, in Sigourney, Iowa, horse slaughter inspection approval. (Iowa DNR Facility Reporter, Responsible Transportation, LLC (2013), available at https://facilityexplorer.iowadnr.gov/FacilityExplorer/SiteDetail.aspx?facID=310375603 ). Both slaughterhouses’ plans to begin processing halted pending litigation in New Mexico federal court. On July 1, 2013, Front Range Equine, the Humane Society, Equine Welfare Alliance, and other horse welfare advocates sued the Secretary of Agriculture, Tom Vilsack, Under Secretary for Food Safety, Elizabeth Hagen, and Administrator for the FSIS, Alfred Almanza, in a case parallel to Humane Society v. Johanns. Front Range Equine alleged that FSIS Directive 6130.1 violated NEPA and the APA. And like the 2007 case, the court found that before administering new inspection protocol, the USDA and the FSIS provided no indication that they even gave NEPA consideration sufficient to invoke an EIS exclusion. The prevalence of drug use in horses and previous environmental infractions by commercial horse slaughter plants supported Front Range Equine’s claim that an EA was necessary because the environmental impact of a plant could be substantial. The USDA asserted that based on its interpretation of the FMIA and barring other legislation, it must provide inspection services to a qualifying plant. Two potential horse slaughter plants, Valley Meat and Responsible Transportation, intervened as defendants. On August 2, 2013, Chief District Judge Maria Christina Armijo for the U.S. District Court for the District of New Mexico granted Front Range’s request for a temporary restraining order against the USDA, enjoining the USDA and the FSIS from inspecting Responsible Transportation and Valley Meat Co. The court further ordered that Valley Meat Co. and Responsible Transportation are enjoined from the commercial processing of horses. (Front Range Equine v. Vilsack, Case 1:13-CV-00639-MCA-RHS, available at http://www.agri-pulse.com/uploaded/Order.pdf , amended by, http://scholar.google.com/scholar_case?case=6058231349241655091&hl=en&as_sdt=2&as_vis=1&oi=scholarr ; see also http://docs.burningbird.net/horse/courtcase/ ). On behalf of the federal court, Magistrate Judge Robert Scott ordered Front Range Equine and its co-plaintiffs to post $435,600 bond as coverage for thirty days of legal proceedings in case the suit causes Valley Meat Co. and Responsible Transportation to unreasonably incur lost profits. Valley Meat Co. claimed to have invested $10 million to make its plant operational and in compliance with USDA horse slaughter regulations. Valley Meat projects that it will hire 50 to 60 employees and process 50 to 100 horses per day. Responsible Transportation reported $2.9 million of investments for its plant and expects to slaughter 40 horses per day. Responsible Transportation has since begun processing cattle at its intended horse slaughter facility and has a conversion plan ready should the New Mexico case rule in its favor. http://www.gpo.gov/fdsys/pkg/BILLS-113s1244pcs/pdf/BILLS-113s1244pcs.pdf). President Obama’s FY 2014 appropriations bill proposal also includes a defunding provision. (OMB, FY 2014 Budget of the Government, available at http://www.gpo.gov/fdsys/pkg/BILLS-113s1244pcs/pdf/BILLS-113s1244pcs.pdf ). Another bill proposes banning horse slaughter directly. Two Congressmen, Senator Mary Landrieu, and Representative Patrick Meehan, introduced H.R. 1094 and S. 541, the Safeguard American Food Exports Act of 2013, in March 2013, which would prohibit the sale or transport of horses for human consumption in interstate or foreign commerce. (S.A.F.E., available at http://www.gpo.gov/fdsys/pkg/BILLS-113hr1094ih/pdf/BILLS-113hr1094ih.pdf ). The Horse Transportation Safety Act of 2013, S. 1459, amends Transportation of Animals 49 U.S.C. § 80502 to prohibit the interstate transport of horses in double-decker trailers. The Border Security, Economic Opportunity, and Immigration Modernization Act S 744 § 1105 would increase horseback border patrol in the Southwest. (S. 1459, available at http://www.gpo.gov/fdsys/pkg/BILLS-113s744es/pdf/BILLS-113s744es.pdf ). While the potential horse slaughter industry stands ready to solve America’s unwanted horse problem, many advocates dispute whether anyone can truly say that more accessible slaughter is good for the welfare of the horse. Despite the GAO report, GAO-11-228, anti-slaughter proponents find that definitive data are missing to demonstrate the extent of an overpopulation problem. (GAO, Horse Welfare, Action Needed to Address the Unintended Consequences from Cessation of Domestic Slaughter (June 2011); see also John Holland, Equine Welfare Alliance, How the GAO Deceived Congress; And Opened the Way for Horse Slaughter to Return, available at http://www.equinewelfarealliance.org/uploads/How_the_GAO_Deceived_Congress-final.pdf ). If the 2 million person, 1.4 million employee, 38.8 billion dollar horse industry has the capacity to reabsorb 1.5% of its 10 million horses, perhaps slaughter is not compulsory. (Fahran K.J. Robb, Horse Slaughter Issues in the United States (May 2012), available at http://law.psu.edu/_file/aglaw/Publications_Library/Horse_Slaughter.pdf ). Even if, by necessity, there are surplus horses, perhaps subsidized euthanasia and a disposal system would be less expensive than inspection or a bullet in the field may be more humane. On the other hand, without domestic slaughter, the same numbers of horses are being transported longer distances to slaughter with less oversight. For example, of the approximately 95,000 horses destined for Mexican slaughterhouses, some die by puntilla, severance of the spinal cord by knife, which paralyzes the horse but does not make it insensible. (Laura Durfee, Anti-Horse Slaughter Legislation, Bad for Horses, Bad for Society , 84 Ind. L.J. 353 (2009)). And if horse slaughter were acceptable, the U.S. would need to comply with EU medical record regulations to have a robust export-based market. The profit margin is conceivably worth tens of millions of dollars to either European or American companies. Other than abstaining amidst current debate, the most conspicuous options for the legislature would be to accept horse slaughter and avoid the details, embrace it and enhance its humane methods, environmental, and export standards, or adopt an affirmative horse slaughter ban, such as S.A.F.E., 2014 H.R. 1094. However, the status of proposed FY 2014 agricultural appropriations bills H.R. 2410; S. 1244 would suggest that the most likely legislation will be a renewed temporary inspection defunding provision and effective federal ban, followed by state and regulatory efforts to bypass. This leaves the future state of domestic horse slaughter for human consumption uncertain.